Sanibel Historical Museum & Village preserves the history of Sanibel Island, Florida back to the Calusa and Spanish Era, through the early pioneer families of the 1800s. With historic buildings restored to their original state, volunteer docents are on site to tell the stories of warriors, fisherman and entrepreneurs who built a rich cultural history here. 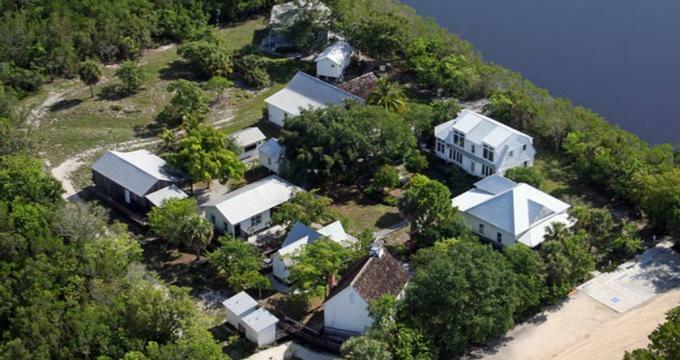 The city of Sanibel, Florida was founded in 1974 and within a few years historian Elinore Dormer had formed the Historical Preservation Committee with a goal to obtain an early Sanibel home that could be restored and turned into a museum celebrating the history of Sanibel. The Meunch family donated the Rutland house to the City of Sanibel and it was moved next to Big Arts and restored before opening as a museum in November 1984 to commemorate the 10th Anniversary of the incorporation of Sanibel as a city. Sam Bailey became chairman of the Historical Preservation Committee and with his election, money was donated for the expansion of the museum into an entire Sanibel Historical Village. By 1992, three more buildings were donated and restored—The Bailey General Store, A tea room, and post office, all from the mid 1920’s. These buildings were moved onsite and restored by the historical preservation’s volunteers. In the following years, a cottage, packing house, garage, schoolhouse, theatre, shore haven, caretaker’s cottage, were added totaling 10 buildings in the village. Many of these buildings have donated family heirlooms, exhibits, and displays that complement the era of the homes original building. The village at Sanibel is comprised of buildings that were brought from different places on the island to be preserved as historical sites for visitors. Shore Haven- The main entrance to the village and where visitors purchase tickets. This is the newest acquisition for the village and was opened to the public in 2014. Built in 1924, this home was a Sear and Roebuck kit home once used as a vacation home by Pennsylvania contractors Ross and Daisy Mayer. This home was a midgrade model and had electric lights and plumbing. Morning Glories- This cottage was built in 1926 and was another Sears kit belonging to the Mayer family as a sister home to Shore Haven. Caretakers Cottage- This small home was built to serve both Morning Glories and Shore Haven properties as a care takers cottage and guest house. This structure could have also possibly housed the generator for the homes at one point. Bailey’s General Store- The Bailey family was one of the first early pioneer families to settle on Sanibel Island in 1895. Frank Bailey purchased properties on the wharf and started a packing business for shipping produce which became the island’s general store. A hurricane swept away the original structure in 1926 but the rebuilt store was moved to the village in the 1960’s and is still operational and owned by the Bailey family. Post Office- This post office was built from scraps of destroyed buildings and floating wood fter the 1926 hurricane on the island. Miss Charlotta’s Tea Room- Built in 1926 by the Bailey family, this structure was designed as a gas station but became the temporary grocery during the hurricane that destroyed the wharf. After the general store was rebuilt, the structure was gifted to Charlotta, the Matthew’s niece, who turned it into a tea room and then in 1934 was used to house school teachers through the 1950’s. The Burnap Cottage- Built in 1898 as a fishing cottage, this structure on Tarpon Bay eventually became a home and had a second story added ad features stained glass windows, and was used as a church at one time also. The School House for White Children- On Sanibel Island, there were two separate school houses, this one, originally located on Bailey Road was intended for white children only, while black children had to attend school on Tarpon Bay Road. The First integrated school was not until 1964. The schoolhouse was used as a theater after the schools were integrated. The Rutland House- Owned by Clarence Rutland, a fisherman, this home was built in 1913 and is an example of a “cracker house”. This home was in the Rutland family until Clarence died in 1982 and brought to the village and used as the museum. Museum Store- Attached to the Rutland House, the museum store sells merchandise related to the history of Sanibel Island and educational books and resource, as well as souvenir items. The store is open Tuesdays through Saturdays from 10am to 1pm.